↑ Kuiper, G. P. (August 1949). "The Second Satellite of Neptune". Publications of the Astronomical Society of the Pacific 61: 175–176. doi:10.1086/126166. Bibcode: 1949PASP...61..175K. ↑ ၂.၀ ၂.၁ ၂.၂ Jacobson, R. A. — AJ (2009-04-03)။ Planetary Satellite Mean Orbital Parameters။ JPL satellite ephemeris။ JPL (Solar System Dynamics)။ Archived from the original on October 5, 2011။ 2011-10-26 တွင် ပြန်စစ်ပြီး။ . ↑ ၃.၀ ၃.၁ ၃.၂ Jacobson, R. A. (3 April 2009). "The Orbits of the Neptunian Satellites and the Orientation of the Pole of Neptune". The Astronomical Journal 137 (5): 4322–4329. doi:10.1088/0004-6256/137/5/4322. Bibcode: 2009AJ....137.4322J. ↑ Grav, T. (2003). "The Short Rotation Period of Nereid". The Astrophysical Journal 591 (1): 71–74. doi:10.1086/377067. Bibcode: 2003ApJ...591L..71G. ↑ "Voyager 2 at Neptune: Imaging Science Results" (1989). Science 246 (4936): 1422–1449. doi:10.1126/science.246.4936.1422. PMID 17755997. Bibcode: 1989Sci...246.1422S. ↑ Brown, Michael E. (December 1998). 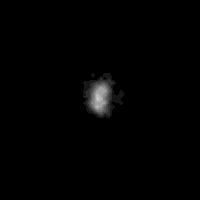 "Detection of Water Ice on Nereid". The Astrophysical Journal 508 (2): L175–L176. doi:10.1086/311741. Bibcode: 1998ApJ...508L.175B. ↑ Kiss, C. (2016-04-01). "Nereid from space: rotation, size and shape analysis from K2, Herschel and Spitzer observations". Monthly Notices of the Royal Astronomical Society 457: 2908–2917. doi:10.1093/mnras/stw081. ISSN 0035-8711. Bibcode: 2016MNRAS.457.2908K.